At Opening Ceremony’s fall show, negative space nail art held its own. Naomi Yasuda for Essie created a design to harmonize with the designer’s collection inspired by Belgium. I recreated the look using Scotch tape on a dried base coat. To match the original design which included Essie’s Aruba Blue ($8.50), I used Wet ‘n Wild’s Save by the Blue ($2.29). What do you this of this design? Let me know in the comments below. While Valentine’s Day is meant to appreciate and acknowledge loved ones, the holiday is also an opportunity to love yourself a little bit more. 1. Perfectly pink digits with a negative space design that says you’re ready to try something new. 2. Two hearts paired with metallic polish for the hopeless romantic with an edge. 3. Plain white nails to embrace a blank slate filled with possibilities of love. 4. A classic crimson base manicure with a plaid design for the bold lover. 5. Glitzy nails for the Valentine that wants to show off her sweet side. What do you think of these Valentine’s Day designs? Let me know in the comments below! After recently playing with Nailed Kit’s water slide nail art decals and Essie’s nail appliques, my love for vinyl nail stickers has definitely grown. So when Jill, a Jamberry Nails Independent Consultant, sent me over a sample of their nail wraps I got psyched and they didn’t disappoint. Initially I was impressed with Jamberry Nails intricate and varied designs. I received six decals and chose to try them on as an accent. The application process called for a unique step after a routine nail cleaning and cuticle push. 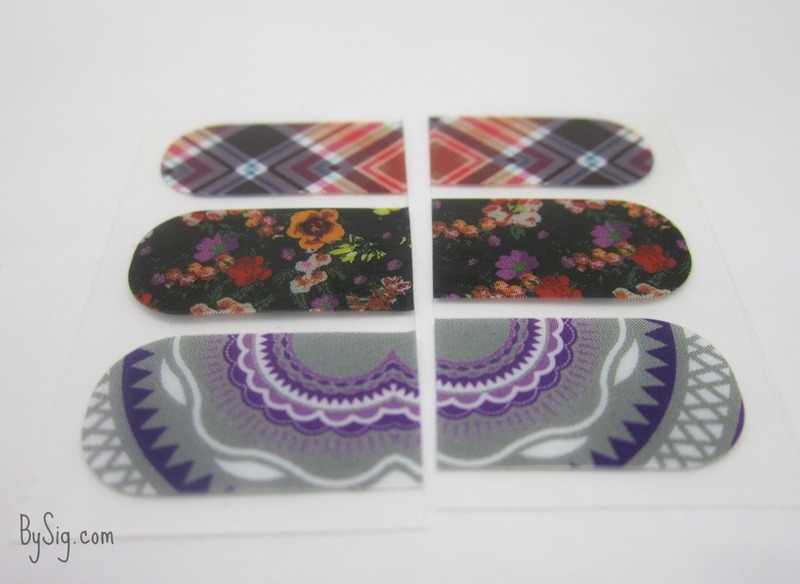 The nail wrap requires heat to soften the adhesive before you stick it on. I pointed my blow dryer on the wrap and used it on a low heat setting for about 5 seconds. It worked. I placed the wrap on my ring finger while it was still warm. I found it best to make sure the placement fit before pressing on the wrap to seal it on because the glue got pretty sticky. I used a rubber cuticle pusher to flatten out any bubbles that formed. I folded the leftover sticker and filed it off in a downward motion to get the right fit. While the included directions do not mention to seal the sticker with a top coat, I recommend applying a layer of it if you intend on wearing the wraps for a few days. This is a sample of Reminisce ($15). I paired it with Marc Jacobs’ 128 Nirvana ($18). This is Poised Plaid ($15). I paired it with Essie’s Blanc ($8.50). This is Wisteria ($15). I paired it with Marc Jacobs’ 122 Ultraviolet ($18). What do you think of Jamberry Nails? Let me know in the comments below! Essie’s “Steel the Way” sleek stick nail appliques ($10.25) come in a textured chrome honeycomb design meant to mimic a glam nail art look without picking up a brush. While the packaging says the manicure will last up to 10 days, mine came off while I was eating pizza. The packet comes with a sheet of 18 stickers (ranging in size), a nail file, a plastic application tool and easy-to-follow instructions. No base coat or top coat was recommended, so upon execution simply use your index finger and thumb to apply the suitable fitting nail sticker and even out any bubbles with the application tool. Once perfectly placed, fold over the leftover sticker and file it off in a downward motion to get the right fit. After completing the manicure I was extremely pleased with the beautiful design. The instructions did not recommend a top coat, so I left it as it. About six hours after applying the nail appliques, I found myself grubbing on some pizza and noticed the extra sauce caused the sticker to lift up. By the time I was done eating, I lost a nail. That was no fun. My one recommendation: don’t skip the top coat if you want these beauties to last. What do you think of nail stickers? Let me know in the comments below. Happy New Year! I am kicking off 2014 with adorable nail art you can execute with no messy clean up. Over the holidays I received a generous gift from Nailed Kit, a user friendly water slide nail decal system that offer’s a monthly subscription. The gift was a sample of their January Box. The January kit included soft blue nail strips, penguins, snowflakes and blue striped nail art decals, teal rhinestones, a shaping stick and a nail file. This was my first time using nail strip decals and I couldn’t believe how easy it was. As a nail strip decal novice, I didn’t perfectly place the decal correctly the first time around. But it was no sweat because I was able to easily remove the decal and try again. I used my thumb and index finger to place the decal and followed with the shaping stick to smooth out any bubbles. If the the strip was a little big, I cut around it with facial hair scissors for precision and filed down the decal to fit my shape. The entire process is relatively simple: Apply the nail strips (as pictured above), cut out desired decals, soak them in water for about 20 seconds, place the decal and rhinestones on the nail and seal the design with a top coat. As a bonus, I even got these special edition New Years decals inside the box. I paired the New years decals with a metallic silver polish and even added Nailed Kit’s party hat decal I received at the New Girl Expo. I’m wearing Butter London’s Diamond Geezer ($15). Other than the obviously cute designs you’re left with, the best part about Nailed Kit is that there is no messy clean up. Isn’t that reason enough to want to try it? What do you think of Nailed Kit’s January Box? Let me know in the comments below. This year I found creative expression. I will remember 2013 as the year I discovered nail art. Though I’m little late in the game, I don’t care. I am up to something I am passionate about and I am not going to stop learning and growing any time soon. In fact, by this time next year I will be a licensed nail tech (stay tuned to find more about that in a future post). 1. Glamorous oxblood nails paired with a gold and black glitter accent to ring in the new year in style. I’m wearing OPI Visions of Love and Wonderous Star from the Mariah Carey mini holiday set. 2. A twist on the tip of a black prism manicure to show you’re ready to take on new challenges and let the light in 2014. I’m wearing Liquid Leather and Prism by China Glaze. 3. Show off a sequin-filled negative space mani thats reminds others to keep their eye on you in the coming months. I’m wearing Maybelline Express Finish Denim Dash with gold glitter pieces. 4. Up the ante at the stroke of midnight with a tape design your future self will thank you for. I’m wearing Blanc by Essie, Mirror Mirror by Orly and All Sparkly and Gold by OPI form the Mariah Carey holiday set. How will you remember 2013? Let me know in the comments below.